Separate - Extracted data is written to a separate child table. The data in the child table will be linked to data in its parent table by a key. 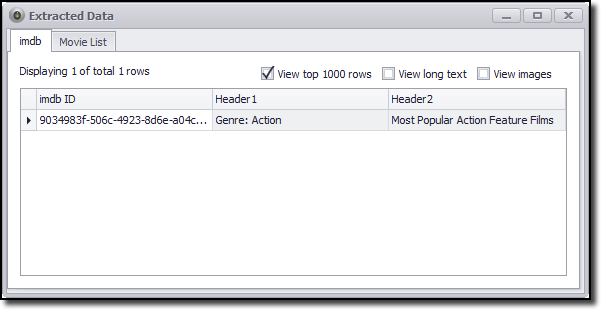 Add columns and Rows - Extracted data will be merged with data extracted by the parent container command. Each data entry extracted by this container command will add a new row in the data table, and new data fields will add new columns in the data table. Add columns Only - Extracted data will be merged with data extracted by the parent container command. Data entries extracted by this container will not add new rows to the data table, but new data fields will add new columns to the data table. If this container extracts more than one data entry, only the last data entry will be used. Add Columns and Merge Rows - Extracted data will be merged with data extracted by the parent container command. If this container extracts more than one row, the values for each row will be combined to generate a single row, which will then be merged with data from the parent container command. The Capture command option Merge Rows Method specifies how the row values are combined. Convert Rows Into Columns - Extracted data will be merged with data extracted by the parent container command. 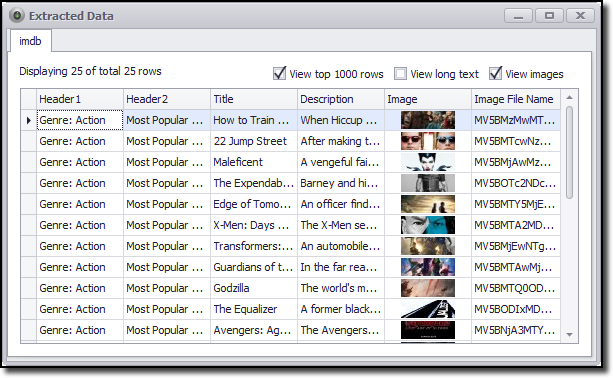 Each row extracted by this container adds new columns to the data table. The option Export Rows to Columns Name Command can be used to specify which Capture command extracts the data that will be used as the new column name, and Export Rows to Columns Value Command can be used to specify which Capture command extracts the data that will be stored on the column. A capture command that will provide the data for column names. This property is optional, but must be set together with a command name for the Value Command property. A capture command that will provide the data for column values. This property is optional, but must be set together with a command name for the Name Command property. Specifies the name of the primary key column in the exported table (database table, spreadsheet, CSV file, XML Node), if this container generates a new table. The export name post-fixed with ID is used if this property is empty. If multiple agents are exporting data to the same table, then you must set this option to the same value for all those agents. Specifies the name of the exported table (database table, spreadsheet, CSV file, XML Node), if this container generates a new table. The command name is used if this property is empty. If multiple agents are exporting data to the same table, then you must set this option to the same value for all those agents. Specifies the plural name of the exported table if this container generates a new table. The Export Table Name with the added character s is used if this property is empty. This property can be used to control the name of XML nodes when exporting to XML. Exports a single empty data row if this container extracts no data. Parent and sibling data will be lost if merged with an empty data set, so this option ensures that parent and sibling data is exported when this container extracts no data. When using this method, data extracted by commands in the container will saved separately. If, for example, the data exports to a database, then the data extracted by the container will go into separate database tables. The figures below show a simple agent having one list container, along with the data export it generates. 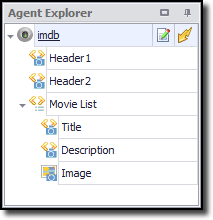 By default, the Movie List container will merge its data with the data from the imdb container, and the result will be a single data table containing the entire data extraction. data from the "imdb" container. In this example, you can separate the data from the Movie List command by setting the property Export Method to Separate. The data is exported to separate data tables when the property Sub-Container Export method is set to Separate. When using this export method, data from the container will combine horizontally with data from its parent container as shown in the example below. Only the last data row will be used of the container extracts more than one data row. When using this export method, data from the container will be combined into a single row, which is then merged with data from its parent container as shown in the example below. You can achieve this by setting the property Export Rows to Columns Name Command to the name of the command that will extract the values you want to use as field names. Also, set the property Export Rows to Columns Value Command to the name of the command that will extract the values you wish to use as field values. Using the export method Convert Rows Into Columns can lead to a different number of columns in the exported data table every time you run an agent. This is usually only desirable when exporting data to Excel spreadsheets, and may sometimes be useful when exporting data to CSV files.